These are postings while in the field that are contemporaneous with sightings and senses. A variety of modes employed to make the log entries short bursts that come from the field. iPhone, e-mail application and other modes are used to upload into WordPress while in the field. 12:00 p.m. — 1:08 p.m.: After thirty minutes communing with a fussy wren, I finished a brief field observation with a walk up Salt Creek about one-tenth of a mile. I logged tadpoles, frogs, wrens, bluejays, heard the cry of the red-tailed hawk or the Harris hawk, photographed a turkey vulture (not included herein) and saw the owl (unidentified) fly into the grove away from my hike. Back at the ranch house, I identified the wren that had chattered at me — a Bewick’s Wren (Thryomanes bewickii). I saw numerous tracks in the mud. I counted two monarch butterflies within the cool willows of the water cache — see photograph below for the Salt Creek water cache with sky blue. 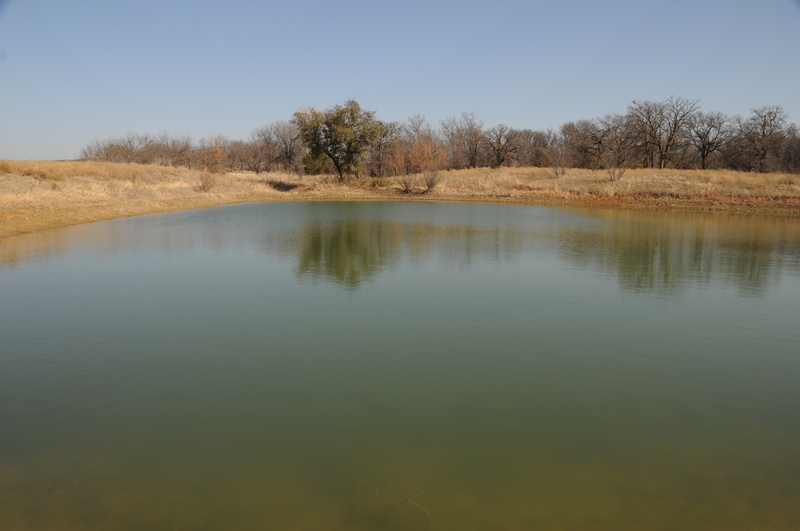 Salt Creek water cache with sky blue (October 15, 2011). The Audubon Society Field Guide to North American Birds states that Bewick’s Wren prefers drier conditions to its resemblance, the Carolina Wren. Bewick’s Wren has certainly enjoyed dry conditions throughout the summer. I liked this photograph of the prickly-pear cactus with the willow and pecan trees in the background. It describes in essence what this part of Texas and my ranchito is all about — wet and dry, green and brown, cactus and pecan, things-that-stick-you and things-you-eat. Fox I did not see. I did not expect to see any, but one never knows. My friend, Wild Bill of Wild Ramblings Blog, suggested that I get a animal call tool that sounds like a wounded rabbit to attract the fox. I think I shall because I want to see fox again. Cougars and bobcats have been sighted in our area, so I shall be cautious. I don’t want my day spoiled by predators of that size taking me from behind. We have a saying out here, “If it doesn’t sting or bite you, it will stick you!” I’ll take the stinging and sticking anytime over the biting. Now, where are my field catalogs? 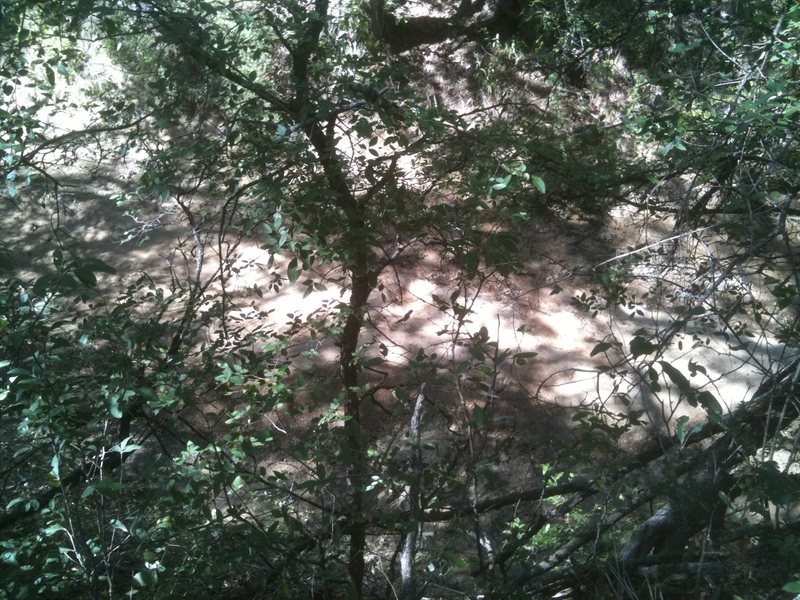 Eight minutes ago, I sat down at the site in the grove, above Salt Creek about fifteen feet, where I saw a fox trotting in the creek bed several years ago. I have a folding chair I sit in, my field log, pen, iPhone for composing and taking pics and an internet connection. Since seated, I log: turkey vulture shadow passes over me, an unidentified wren chatters at me ten feet away, rifle and shotgun firing in the distance, crows cawing, vehicle traffic on SH 108, cool breeze. I heard the Sandhill, but did not photograph. But they were 2,000 feet above me. Got the camera, but they were pushed by the wind so fast. I estimate 80+ mph. Now I stand in the lane, sun setting, I hear, but do not see. I’ve heard several Sandhill in the sky above me right now. I cannot see them, but I hear their gentle calls up in the sky. It’s 70 degrees and pleasantly warm. Mail has come and I fired up the F-250 so its cylinders can warm. Star has come running up to the front pasture. Hawks cry in the sky. Big bluestem (Andropogon gerardii), Flying Hat Ranch, Texas, February 2011. The experiment with in-the-field short note taking has come to an end. I am back up at the ranch office and am writing on the desktop, not the iPhone. The use of the iPhone in the field for short bursts of updates works, but the photographic uploads into my blog via iPhone did not work. Part of the problem is that our ranch is way out in the brush and our cell towers are at Bluff Dale and Morgan Mill, Texas, miles and miles away. For any extended commentary, a laptop with a wireless connection is much preferable to the iPhone although I will try the iPhone mode again. While in the field today I kept a written journal and took photographs with another camera. I am posting the photographs of high grass in the pasture. 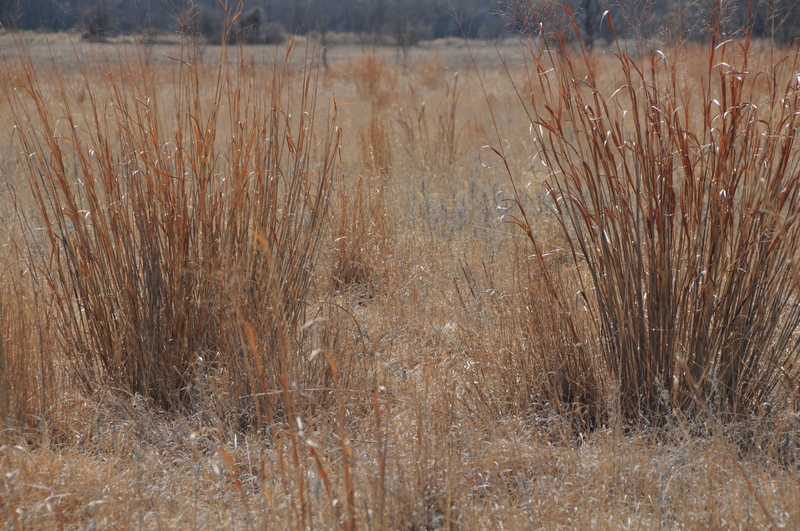 The Big bluestem is “big,” reaching six-feet tall. 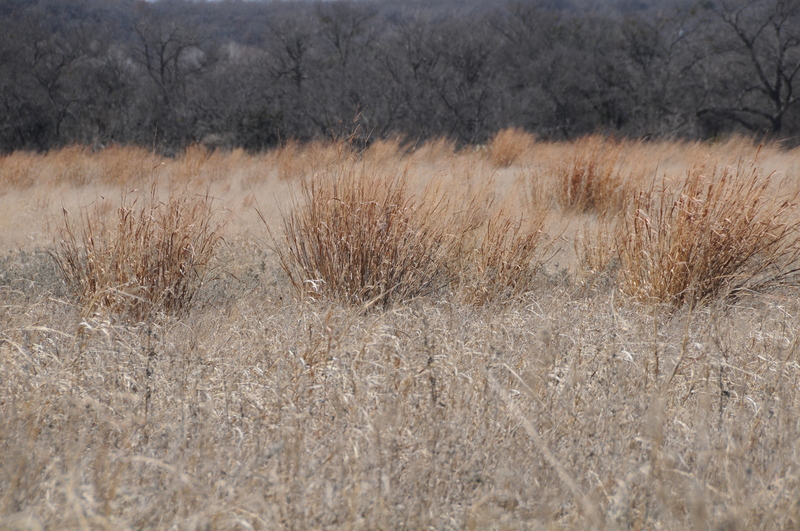 The Little bluestem is about three-feet tall. For now, enjoy the field photographs. 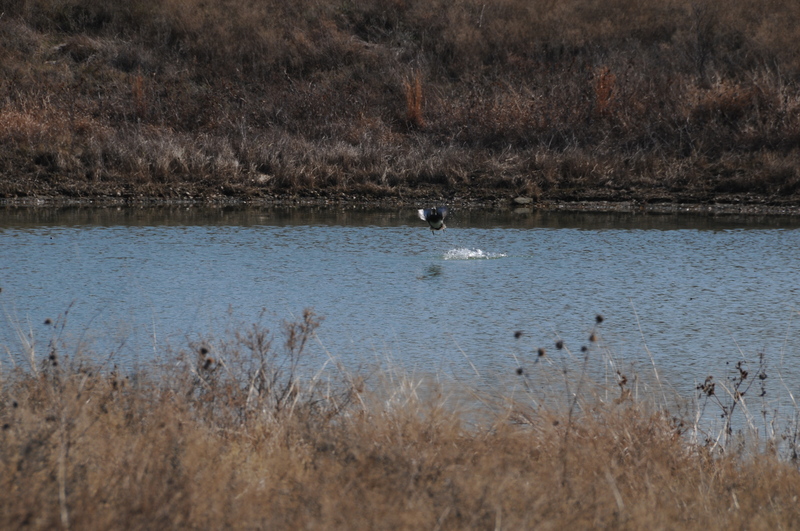 Unidentified duck taking flight from the stock pond. Still waters on the stock pond, ducks have taken flight to Blue's pond to the north. 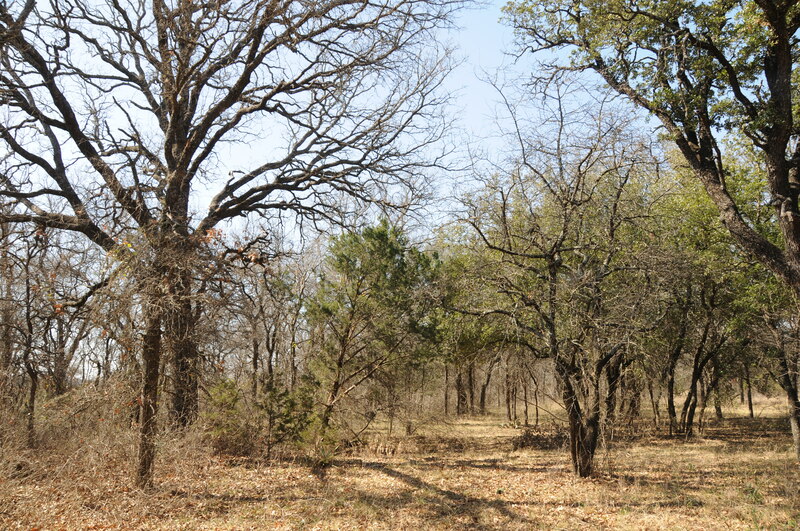 A typical Cross Timbers life zone that has been harvested and cut for several generations. The tree grove is rebuilding itself. Big bluestem, Flying Hat Ranch, Texas, February 2011.